Two 1920’s Period Rooms were begun by the Junior League as early as 1975, with stewardship being transferred to the Thomas Center Associates in 1983 to complete and expand. 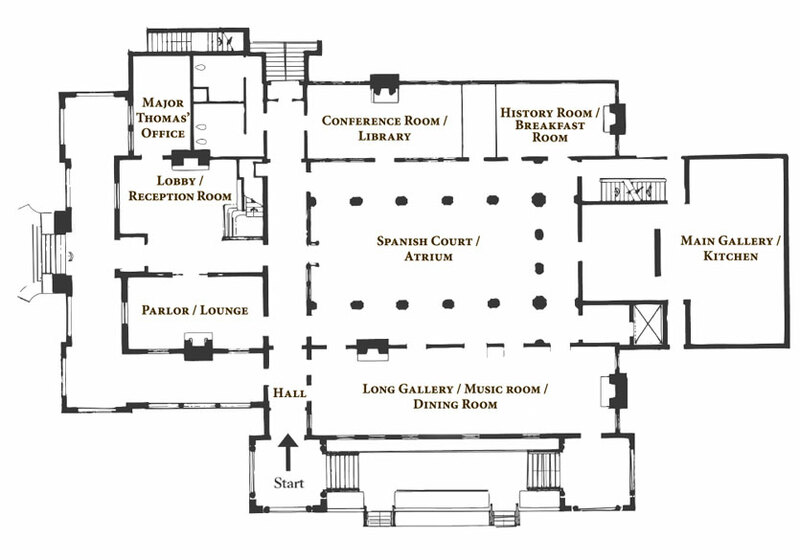 The Parlour/Lounge, Major Thomas’ Bedroom, and his office are the only actual museum rooms designated solely for viewing, while the Reception Room/Lobby, the Lucille T. Maloney Conference Room and the Sam Gowan History Room are designed to function also as much-used public spaces. All reflect Hotel Thomas decor as this was the period to which the buildings were returned in the renovation. Take a virtual tour of of the Thomas Center by clicking on the rooms below. The Major used this large, well-proportioned room as his bedroom when the family moved into the newly-completed home in 1910. Later, when he modified Sunkist Villa and added a new wing to create Hotel Thomas, he “modernized” his room by refurnishing at the same time he was ordering stylish pieces for the new hotel. Family members have shared recollections and artifacts to help the Thomas Center Associates recreate this museum room. The furnishings and their arrangement not only illustrate the decorating trends of the time, they also reflect the Major’s own habits and personal touches, such as the photographs of his parents, his wife, Katie, and other family members. His old cedar box, a family Bible, a comfortable Morris chair and his ever-present cigars help us envision his private retreat at the end of a busy day. Throughout the school year, third grade classes come for a docent-led tour of the Thomas Center as guests of the Thomas Center Associates. This entertaining tour teaches the children about the Thomas family, Hotel Thomas and their role in Gainesville history. If you are a teacher of a third grade class in any school in Alachua County, you may contact us to schedule a tour for your class. Email us at thomascenterassociates@gmail.com to schedule a day and time for your class visit. Twice each year, the Thomas Center Associates provide a special opportunity for the public to tour the Thomas Center museum rooms at no charge. Led by a docent costumed in 1928 clothes, these entertaining tours inform about the Thomas family who lived in the home, the Hotel Thomas, and the role it played in Gainesville history. The tour begins at 11 a.m. on a Saturday morning. Meet in the Spanish Court of the Thomas Center on the tour date. Thomas Center docents are available to lead tours of the Thomas Center period rooms for groups who would like to learn about the Thomas family, Hotel Thomas and their role in Gainesville history. If you are a member of a group that would like to have a docent-led tour of the Thomas Center on a weekday, please email us at thomascenterassociates@gmail.com to arrange a date and time for your tour. The fee for these tours is $5 per person. Groups may pay prior to the tour date by check written to Thomas Center Associates or online. Enter Building A of the Thomas Center through the doors facing 6th Avenue. This building was Sunkist Villa and contains the period rooms as well as some city offices. There are brochures in the entrance hall that are provided by the Thomas Center Associates with the floor plan of this building. You can use your cell phones to hear about each of the period rooms. Throughout Building A, you will find signs that tell you how to reach the cell phone tour.